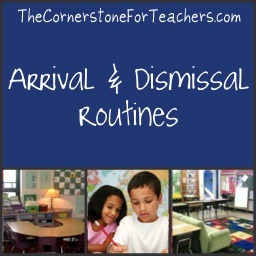 This page (which is a chapter overview of The Cornerstone book) describes 3 major routines for your daily schedule: arrival at school, returning to the classroom from lunch and special classes, and dismissal. You’ll discover a variety of different procedures for each so you can choose ideas that fit your teaching style and situation. o you’ll see lots of different ideas here. Remember that routines can and should be modified throughout the year, so nothing is ever set in stone. Decide on something you think will work, teach it to your students, and adapt it as needed, taking the time to explain to children why you are making changes and showingthem exactly what you’d like them to do differently. The possibilities for classroom structure are varied, and you have a great deal of freedom to try new things when you know how to teach procedures effectively. When students first enter the classroom each morning, they should expect a predictable set of tasks to be awaiting them. This will set the tone for the entire day and communicate to children, “Welcome back. This is a safe, familiar place for you. You know exactly what to do, and you will be successful at meeting the expectations.” The morning should be a calm, quiet time (assuming that’s your preference) for you and the students to gear up for the school day. The precise tasks you require of your students will depend on your school’s arrival system for students. One of the most influential factors is whether children will be slowly trickling in for fifteen to thirty minutes, or whether most will arrive all at once. If students come in slowly, you will need to have open-ended and ‘early finisher’ activities planned for students who have completed their tasks before other students even enter the room. This can be handled quite simply by having early arrivers read books quietly or get on the computers. If students come in all at once, you will need to design procedures to prevent chaos when students are unpacking, getting their chairs, and sharpening pencils. If your children line up outside your door in the morning, you can let five in at a time when the bell rings, and spend a moment greeting and talking with the others. Regardless of your situation, you will still have many routine tasks you want students to complete: unstacking chairs, unpacking book bags, taking out homework and papers from home, using the bathroom, sharpening pencils, and so on. You will need to explain these things on the first day of school. I usually review them at the end of every day during the first week (“So, when you arrive in the classroom tomorrow morning, what are the things you will need to do?”). I also include them on my Morning Work list written on the board until students are able to recall and complete them routinely. Whenever students enter the classroom, they should be able to count on a predictable routine. That routine will depend on whether you want students to complete a task right away, or listen for your specific directions. You could have different procedures for specific times of the day: for example, when returning from specials, students may need to sit and wait for you to give directions for the science lesson, but when you return from lunch, you may want the class to take out their journals and immediately begin writing. Decide ahead of time what you want students to do each time they return to the classroom. Then explain, model, practice, and reinforce your procedures. One year, I used this chart to show which buses had been called. Dismissal can be one of the most chaotic times of day, especially if students are dismissed slowly by their means of transportation home (bus riders, then daycare students, then car riders, and so on). That’s unfortunate, because a hectic and stressful dismissal can leave the teacher feeling exhausted and unproductive, even if the majority of the day went well. Have structured routines so things don’t end on a crazy note. Insist on absolute silence when dismissal announcements come over the loudspeaker. Have a visual reminder so students know which buses have been called. Keep a record of how students have been dismissed for the day. Another year, I had a lot of kids whose schedules changed daily, so each morning, they moved their clothespin to indicate how they’d be going home. This cute chart provides a record of which students go home on each bus–very handy for substitutes. Implement the strategies you see in the photos above: create structure for the end of the school day, track which students have been dismissed, and get kids to be SILENT during bus call announcements (it is possible!). love your resources and freebies! thank you for sharing! Love the practical tips! Thank you! I have a whiteboard laying on the table right by the classroom door that has three questions permanently written on it: 1) Where should I go? 2) What do I need? 3) What should I do? As I leave the room to go pick them up from lunch or specials, I will write down whatever I want the kiddos to do. Sometimes I’ll just write down where they need to go (i.e. seat, team meeting, read aloud, etc.) and they know to wait patiently… Works like a charm to stop them from just wandering around when they enter the room!